The Problem: It's difficult to track when new episodes of TV shows come out. 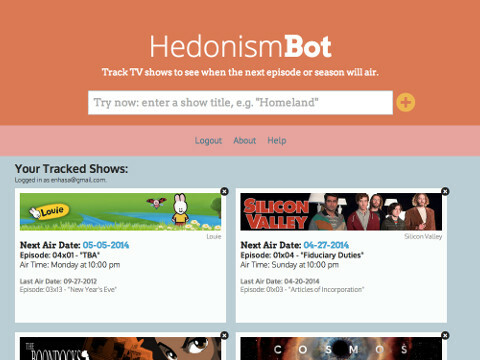 HedonismBot was created as a single-page application delivered in Rails to solve an organizational pain point. Tracking variable data for 15 different shows is hard, so I developed a simple UI to present this information. I extract data from various external APIs then update the data nightly via an automatic cron job. HedonismBot was intended to be a backend-heavy project that focused more on the manipulation of external data than a visually stunning interface.